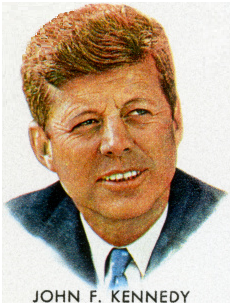 This month marks the 50th anniversary of the assassination of the 35th President of the United States, John F. Kennedy. Many events have been held throughout Dallas and the United States to commemorate President Kennedy’s legacy. In evaluating his presidency, what often gets overlooked is his role in Texas oil, and the shape the industry took (or didn’t take) based on his involvement. Since 1926, oil companies had large tax concessions, which allowed them to hold more resources that were vital for the continued development of American lands to produce oil. This oil was needed for military efforts and citizen use, which is what the tax incentive sought to spur. An added result of these tax breaks were larger financial returns for “oilmen” in the form of both lower taxes and increased oil production. The oil depletion allowance allowed oil companies to keep 27.5 percent of their revenue tax free. President Kennedy intended to re-evaluate America’s oil needs, which could have involved doing away with the tax concessions the industry enjoyed. Removals of these tax incentives were estimated by World Petroleum to subtract more than $250 million in additional profit. President Kennedy’s involvement actually stretches back to his vice president, Lyndon B Johnson, while Johnson was a senator. Jane Wolfe recounts in her book, The Murchisons: The Rise and Fall of a Texas Dynasty, that Johnson would often meet with Texas’ most influential oilmen prior to becoming vice-president, and discuss politics with them, alluding to which senator needed support in order to keep the tax incentives flowing. The oilmen then ensured that these politicians had the financial means to push their legislation forward. Johnson’s charm with Texas oilmen soured when he joined Kennedy’s presidential ticket. Johnson joining Kennedy meant that oilmen lost an ally in the senate. And while they were upset at Johnson, they were also likely frustrated in having little influence with President Kennedy. The oilmen’s fears were correct, and in 1962, President Kennedy and Congress passed The Kennedy Act, a piece of legislation that removed distinctions between company’s profits, created to dissuade American companies from investing abroad. This act especially pinched oil companies. It’s estimated that it cost them 15 percent of their profits on foreign investments. A year later, in 1963, President Kennedy proposed removing the oil depletion allowance, the main tax incentive for oil companies. Estimates showed that it would have cost Texas oilmen $300 million in profits each year. But as we all know, the unthinkable happened on November 22, 1963, when President Kennedy was assassinated. Johnson abandoned the discussion of removing the allowance, as did his successor, President Richard Nixon. Given the size and influence of the oilmen and the rampant nature of skepticism surrounding President Kennedy’s death, some have proposed that his assassination was directed by oilmen, as famously covered in Barr McClellan’s book, Blood, Money & Power: How L.B.J. Killed J.F.K. although the Warren Commission concluded that Lee Harvey Oswald acted alone in killing Kennedy.